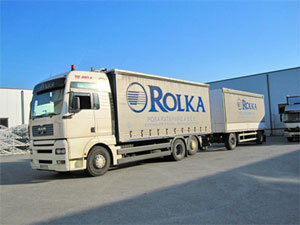 The company uses privately owned trucks in order to transport its products. Every Monday there are routes to Athens. From there on, the products are either delivered inside the prefecture of Attiki or are transported to other destinations by common carriers. Every Tuesday and Thursday there are routes to Thessaloniki. From there on, the products are either delivered inside the prefecture of Thessaloniki or are transported to other destinations by common carriers. Every Tuesday there are routes to the prefectures of Thessaly. There are unscheduled routes to any destination inside Greece when there is a sufficient quantity of goods to be delivered. Deliveries and loading of products takes place at the company’s central office using international truck transportation services at the customer’s request.